The 1972 FA Cup final was played on May 6th, the same day I sat my entrance examination for Beneavin College in Finglas. As I walked from my home in Finglas Park, it seemed oddly reassuring to know that – two hundred and ninety miles away – twenty two grown men surely felt as nervous as I did. A hundred years after the first FA Cup final was played, they lined up in the tunnel at Wembley for what was called The Centenary Final (although nine finals had never occurred, due to two World Wars). John Giles, Jack Charlton, Norman Hunter and Billy Bremner were on the Leeds team that would triumph. Pat Rice, Alan Ball, Charlie George and George Graham waited among the Arsenal team to be vanquished. We also lined up outside the hall in Beneavin that day: Bolger, Nolan, Keating, Brocklebank, Kavanagh, Stokes, Fitzmaurice and numerous others. Arsenal and Leeds had ninety minutes ahead of them: but five long years of secondary school awaited us – the concept of Transition Year only reached Finglas (along with nylon shell suits, designer underwear and Michael Jackson’s dubious lyrics) after we had left Beneavin in 1977. One difference of course was that those footballers were considered legends in their own lifetimes: we merely became legends in our own lunchtimes as we eventually inherited the mantle of being the Sixth Year Boys: the cool dudes whom the school invariably look up to. This is the one lesson in being either a professional footballer or a secondary school student: legends are quickly forgotten. No matter how great your tales of dare-doing are, they are quickly replaced by newer tales. The other thing that being a footballer or pupil teaches you – though only in retrospective – is that we cannot predict the future or fire-proof themselves against it. Who could have known in Wembley that Pat Rice would spend forty-four years at Arsenal or that one striker, George Graham, would become a successful manager while another striker, John Radford, ended up playing non-league football with Bishop Shortford and was briefly a pub landlord. Similarly, how could we have known that one of future classmate sitting that entrance exam would die in a freak accident shortly after finishing school or just what other unexpected twists life held for us? One lesson life teaches you for certain is that, no matter how legendary a football team is or how great a camaraderie exists between classmates, at is always another September when another group sit at the same desks or in the same changing room, so caught in the bubble of their own world that they have as little interest in the people who came before them as we had in tales of former students when we sat our exam that morning which segregated us into streamed classes number A, B, C and D.
I scraped into C and learnt Spanish and mechanical drawing instead of French and accountancy. I studied hard in the next five years, yet few of the important lessons I learnt there related directly to any curriculum. When the American poet and monk, Thomas Merton, was asked what star sign he was born under, he replied that – like all mankind – he was born under the sign of contradiction. Therefore what stood out most for me were contradictory moments when I realised that life is rarely a simplistic black and white. In 6th Year I published an article in a national newspaper attacking, from a teenage perspective, various Catholic teachings. A deeply conservative elderly teacher approached me at break to say (as I expected) that he fundamentally disagreed with every word I had written. Then he added (which I didn’t expect) that he passionately respected and defended my right to articulate those opinions utterly at variance with his. I shook his hand, having learnt more in our thirty second exchange than I had learnt in three years in his class. It was a perturbing moment: previously I could lazily see a teacher like him as a caricature, but it made me confront the reality that he was a rounded, thoughtful and contradictory individual. In Sixth Year I remember a head brother – a figure of great authority – telling my class, in a nakedly revealing moment, that at some stage after he woke every morning he wanted to give up in despair at life, but this moment passed because he had responsibilities, and he simply got dressed and got on with the business of his life. Not every boy understood what he was talking about – or realised that, in different ways, some of us would later feel besieged by burdens of responsibility or debt or addiction or duties of care that we would feel unable to bear but would continue to carry. However every boy present understood that he was treating us as fellow adults in his admission. Not all brothers treated us like adults – though I remember only kindness and an amused tolerance of my long hair and my confused, rebellious and naïvely idealistic notions. But an elderly Christian Brother briefly returned from Africa. Fuelled by an incandescent rage at how Ireland had changed, he would interrupt classes to burst in and ordering us to accompany him to the hall. I remember the terror of my fellow pupils and also alarm and contempt in the eyes of lay teachers who felt powerless to publically intervene, though I suspect they immediately ran to warn the principal. When we were corralled in the hall, he stood on a chair to lead us in hymns, eyes darting around manically before he would pounce, with a leather strap, on some boy whose singing he did not deem sufficiently pious. This time travel into a vanished Ireland never last more than a few minutes before the Principal appear to coax him from his chair and send us back to class. I felt terror then. I pity him now because he was obviously unhinged and needed medical incarceration for his mania. For his sake I would like to think he received help in an asylum, but I suspect he was simply been shipped back to Africa. I mention this blot because it is important to mention blots. The first instant of almost every sector in Irish society, from banks to churches to doctors, is to circle the wagons and go tribal. There were excellent teachers and one or two unstable ones. This is true of all schools and all professions. This is not a criticism of Beneavin because enjoyed my years there and the encouragement I received for teachers shaped the person I am now. But like Merton mentioned, we are born under the sign of contradiction, no institution is flawless and you learn as much by occasionally confronting difficult situations as by being buoyed by artificial encouragement. Beneavin changed my life. I made true friends there. Some kept in touch, others I lost contact with. Three years ago I lost my wife. One of the first calls I received was from a former class mate, Eddie Nolan. It was a quarter century since we last spoke, but within seconds it was we were like schoolboys walking home again together. You rarely make such friendships in later life because no years are more intense, more filled with excitement and anxieties and shared discoveries than your secondary school days. One of my first phone calls after my bereavement was to my former English teacher, Colm Hewitt. Like my ex-classmates, he had known me since I was 13. Such people can see the totality of my journey, like I see the totality of theirs. The day after passing that entrance exam to Beneavin I left primary school to get a summer job as an under-age ice-cream van boy. I remember lying on a bed that summer, having inherited a copy of “Exploring English” (the prescribed Inter Cert English anthology of short stories) from my brother Roger, who scored the winning goal in 1973 when Beneavin won its first All-Ireland Schools soccer final. That book represented the cusp of a new life and gave me two lists of names to wonder about. The contents page listed new writers like Mary Lavin, Liam O’Flaherty and James Plunkett. But the back cover contained a second handwritten inventory of names of the rock bands he and his long-haired friends were listening to, like Led Zeppelin and Thin Lizzy. I remember my apprehension on my first day in Beneavin and our English teacher, Colm Hewitt, coming in to eye up the thirty would-be “hard chaws” sitting there, then taking out a book called “The Hobbit” and mesmerising us by reading it aloud. It was to Colm that I tentatively showed my first poems. He not only encouraged but gave advice. He gave me a gift of a Selected Yeats which I still possess and took us to see complex plays like The Sanctuary Lamp in the Abbey. I would have become a writer even if I had not gone to Beneavin, but my journey would have been different without the support that he and others there gave me. It took me a long time to realise the true gift Beneavin gave me at that time: the most vital encouragement there is: the space to be different. That deranged Christian Brother who returned to Africa belonged to a dead system designed to stifle difference, originality and non-conformist thought. 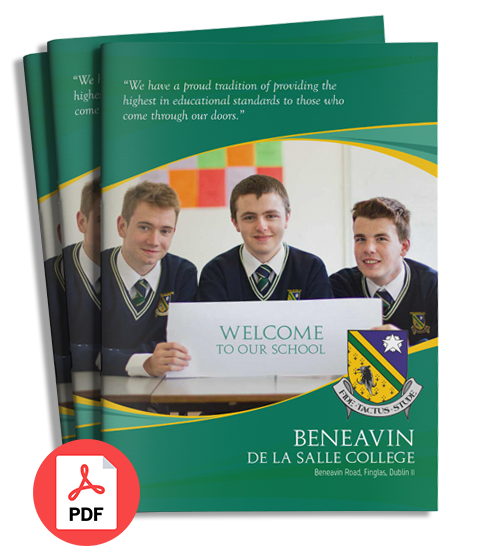 I don’t know what Beneavin is like now, but in my five years being there felt like being part of a debate between a conformist Ireland – personified by some elderly teachers pontificating about God’s “natural order” – and younger teachers and students asking the awkward questions that every society needs to ask to examine itself properly. But I’m being simplistic in calling it an age thing. Older teachers could surprise me (like the man defending my right to write what I pleased), while the greatest bigot I met there was a young temporary history teacher. It was a haven of sporting success, a place where the quality of teaching was generally excellent, but at that time it was, more importantly, a place of debate where an oddball writer wasn’t made feel like an oddball. Some years ago I returned to address some ceremony there. A junior government minister made an appalling speech written for him by someone else. He only ad-libbed once to bizarrely boast that, for all its sporting success, Beneavin had never produced a politician, while his O’Connell’s class had produced two – one of them a convicted felon, Ray Bourke, though he referenced his disgraced colleague in more glowing terms. He urged students to study hard and obey their patents. Other luminaries repeated this mantra so forcefully that I can’t recall what I said in my speech, beyond probably sheepishly echoing their sentiments. What I regret is that I didn’t recall that head brother disquieting us by talking about human despair in our classroom, hinting at the complexity of human life outside the school gates. In school there are always thirty students and one teacher. Out in the real world there is just you, or if you strike lucky and find love, two of you. I should have ignored 96% of the students and spoken to the 4% who are always the oddballs, the ones unsure of their sexuality or who possess dreams that seem as improbable as mine was at their age. Nowadays students are expected to set out their future ambitions in a CAO form that allocates them college places based on crammed exams, as if they are meant to know what they want to do with their lives at seventeen. I should have told them that I knew nothing about life at their age and am still only learning about it. I should have mentioned the coolest dud in my class who had become a corporate nonentity within a year of leaving, the lads who destined to shine who never shone and the lads who only started to blossom in unexpected ways when finding their true path in life, years after leaving school. Today’s students live in an enforced cocoon: a system teachers dislike but need to operate, which measures success only in Leaving Cert points. I should have told them the Leaving Cert is important in being one factor shaping the course of their futures. But our lives are shaped by many other things: by random meetings at dances or in supermarket queues, by two lives coming together and becoming one. What I wanted to say that night was that, alongside all the point races and sales targets life sets for us, there are other truer measures of success and failure. We don’t know where life will lead us after school. In these economically uncertain times, it is even more impossible to predict the future, no matter how many Leaving Cert points you achieve. But I suppose I wanted to add that, in the end, there are two true measures of having lived a full life, two definitions of success with true meaning. If you can look back and say, “I have loved and I have been loved”, then – no matter what else has happened to you, good or bad – you can feel that you have truly lived a full life and known the essence of what it is to be alive.